SAIC Alum Andie Giafaglione Goes "Inside the Friendly Confines"
Image courtesy of the artist for Chicago magazine. Jim Bullinger at Family Day, 1996. 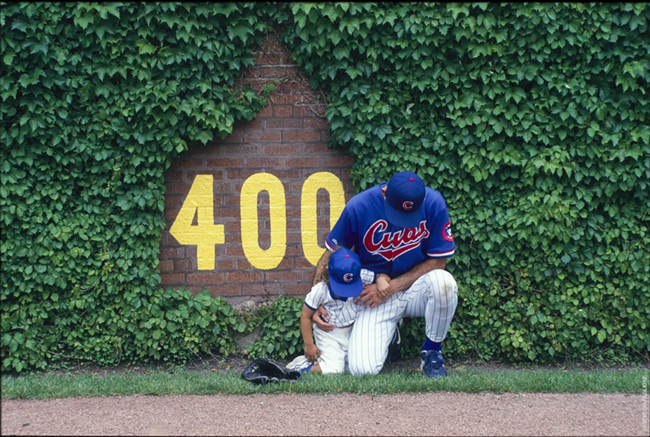 Chicago magazine recently interviewed SAIC alum Andie Giafaglione (BFA 1995) about her time photographing the Chicago Cubs from 1996–99. Before camera phones and the steroid scandals of the early 2000s put players on guard, Giafaglione had an intimate look at the inner workings of the hometown ball club. “I learned more about photography in that time than in any other class or job,” Giafaglione told Chicago magazine. During her four seasons shooting at Wrigley Field, she encountered local and national baseball greats such as Harry Caray, Andy Pafko, Sammy Sosa, and Bill Gleason. In honor of the Cubs’ lead in the Major League Baseball Division Series, 35 of Giafaglione’s photographs chronicling her time at the Friendly Confines will be on display at the GMan Tavern at 3740 North Clark Street, just a block from the famous stadium. .